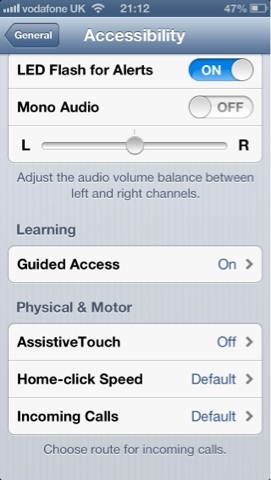 So in this part we will be going through the settings in the General, About & Siri Submenus. Is not only a place to find specific information out about your iDevice but it's also features some small tweaks to really personalise your phone. Name - Yes you can name your device, anything you want. This will show up every time you plug into iTunes, will show in your wifi devices etc etc. Go mad, let your imagination run free but please don't just call it (Your Name) (Your Device) because I can guarantee that there will be another Joe Bloggs who has an iPhone. NB. 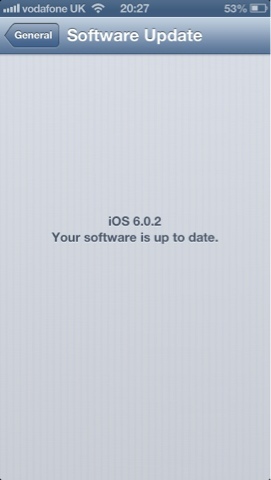 Yes my iPhone 5 is called SJ 5 after Steve Jobs. The next few details are literally about your device, so Network, how many songs you have, and some important details such as imei and serial number. iJoe recommends you write your serial number down somewhere safe, you will need it if anything bad happens. Finally at the bottom there are three submenus called Advertising. diagnostics and usage and legal. Firstly the legal menu has all the legal notices that cover Apples back against your phone, if you want to read them all carry on. 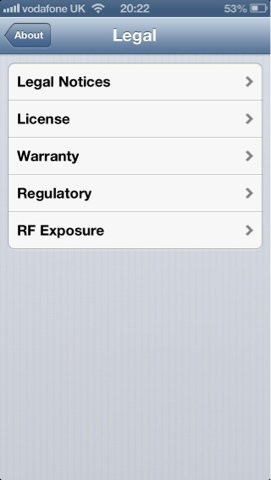 The Diagnostics and usage menu is a place you can set if you wish to send usage data to Apple or not. The data it sends is far reaching and will mostly contain your location, so if your protective of this sort of thing I suggest you turn it to "Don't send". Finally the advertising menu has a small choice for you to make. From all the D&U that Apple gets from the above it will then utilise its iAds in some of its apps to be specifically tailored to you and your location. If you won't want this to happen and for you to get just generic iAds turn it off. 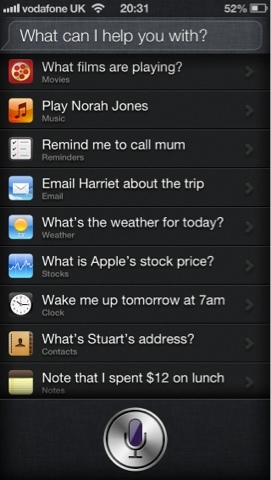 Some very important menus In here and things that can really help utilise your phone to its full capacity. Software update - Every now and again Apple updates the software for your iDevice, to enhance some features or fix some bugs, you can update over wifi this way, if you just pop into this menu it will check if there is an update. 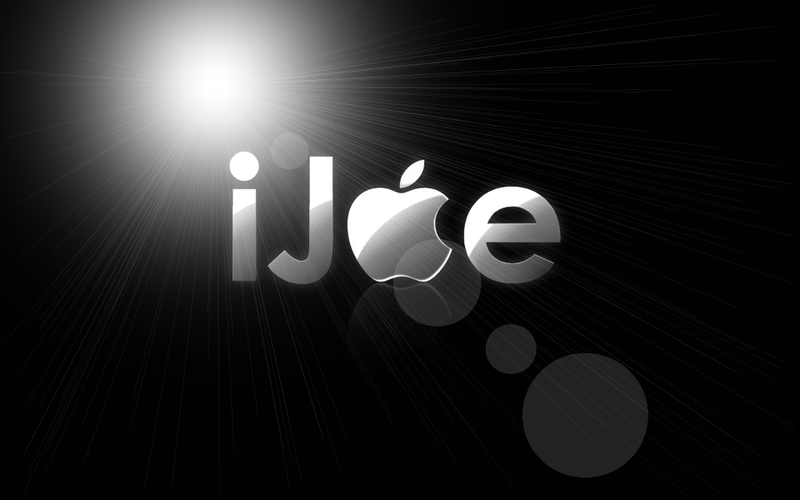 iJoe recommends you update your device to the most available software. 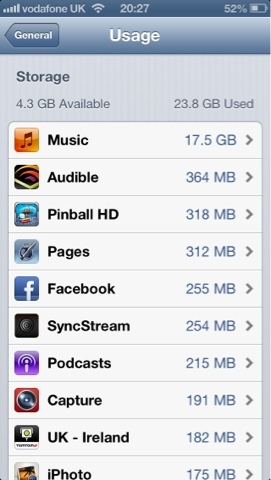 Usage - Shows how much space is taken up on your device and a break down of what is using it. 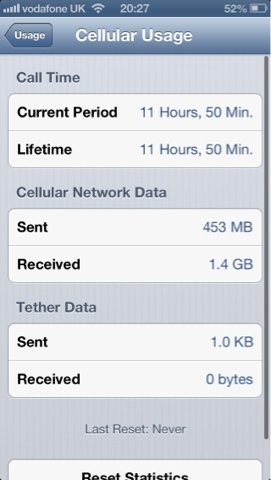 Does same for iCloud and cellular(mobile) usage. 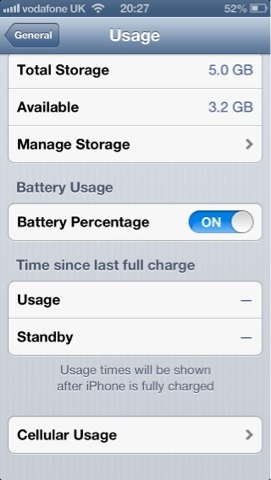 Also can choose to have a percentage displayed by your battery. 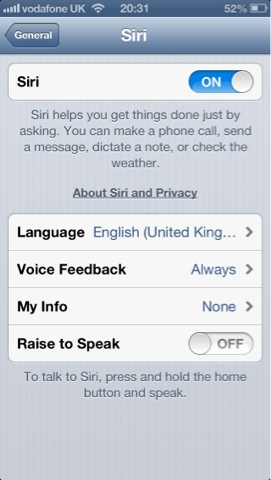 Siri - Any device after the iPhone 4S and iPad 3 is Siri compatible. If you don't know what Siri is its a mobile assistant that when you hold down the home button you can ask it to carry out certain tasks. (All likely tasks are shown in one of the images at the bottom.) Now personally I don't use Siri. It's not a complete enough product for me to get a benefit out of. Plus by turning Siri off you can save a hell of a lot of battery so it's up to u. Cellular - (If your device is wifi only you won't have this.) This is the place to make sure you don't go rocketing over your mobile data allowance. You can set it up to disable or enable 3G, data roaming and what your device uses 3G for such as FaceTime, iTunes downloads etc etc. it's up to you with your download limits and how much of your day you sit in a wifi Zone. VPN - This is a setting only someone who knows what a VPN is will utilise. 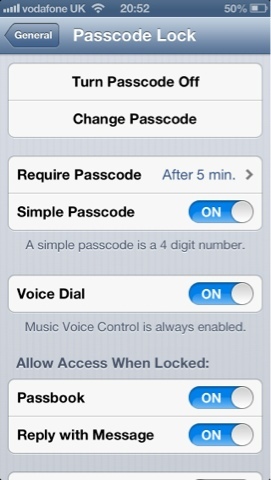 If you have a VPN and want your iDevice to be a part of it you can configure it here. 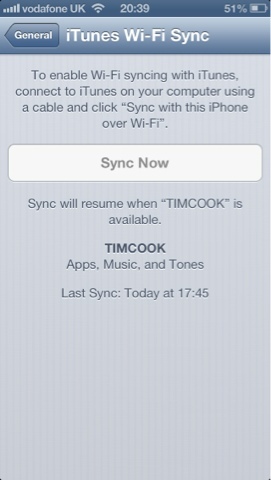 iTunes wifi sync - Since iOS 5 you have been able to use an iDevice without directly needing a computer with iTunes, also you have been able to update and sync your phone via your computers wifi network, you device will do this automatically if your device and computer is on the same wifi, the device is locked and charging and you have selected the option in iTunes for you to wifi sync. Personally I feel this feature is poor, and isn't as reliable as it should be, it not only slows your wifi down it slows your computer and iTunes down because it needs so much CPU to work, iJoe recommends that if you sync a lot of data on or off your iDevice you plug your lightening or 30 Pin connector in. NB. Yes my computer is called Tim Cook. 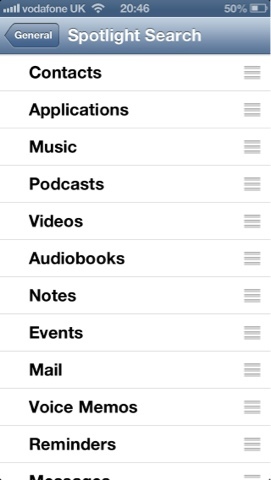 Spotlight search - if you slide your menus to the right all the way your screen will shade out and a search bar will appear. If you search anything in there such as Cat, it will find everything in your phone that features cat, such as a SMS you might of sent and email, a contact called cat, an appointment about a cat. Literally anything related. If you don't want your phone to search all of this data, maybe take out messages or contacts you can change that in this menu. Auto lock - A simple menu for you to decide how long your device will need to be inactive before it auto locks itself. The lower it is the better for your battery life and your security. Pass code lock. - This is basically a pin for your phone. 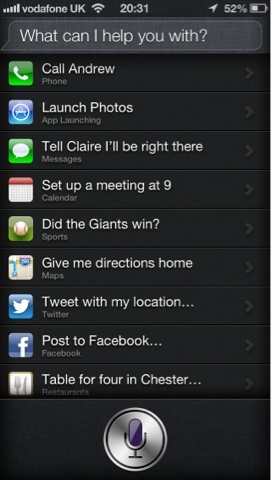 In this menu you can set it up, change how to use it, when its required and which applications can be used without it. One feature I would always make sure is put to NO unless you are a secret agent would be the Erase all data after 10 attempts. This will wipe your phone after 10 incorrect guesses. iJoe would recommend a pass code for your security. Restrictions. - A very clever way to protect your device and bank account if someone else is using your device. 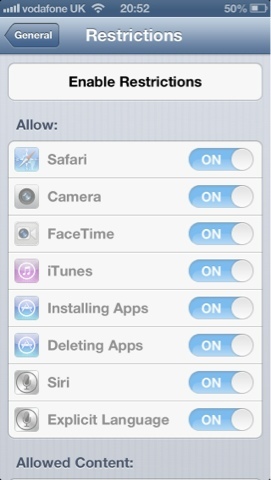 If you enable restrictions you can stop certain tasks from happening such as in app purchases, deletion of apps. This feature really is useful if your children use your device. Date and Time - Self explanatory. 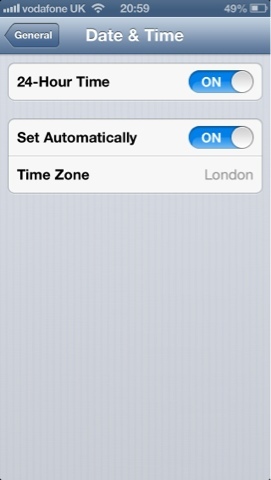 Should be set to set automatically, with your correct time zone below and your choice of 12 or 24 hour clock. Keyboard - A great place to really personalise your phone, firstly the options. Auto capitalisation - if on after a full stop the device will capitalise the first letter of next word. Like this. 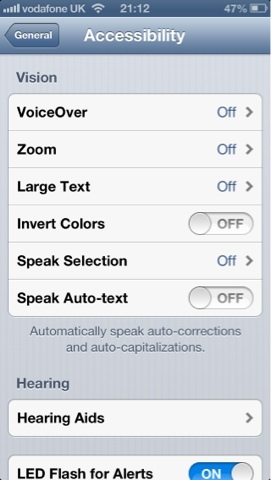 Auto correction - If you make a common spelling mistake your device will correct it for you. Check spelling'- Will check your spelling as you type and underline in red if its incorrect. Enable caps lock - You can put device in caps lock by double tapping on the shift button. "." 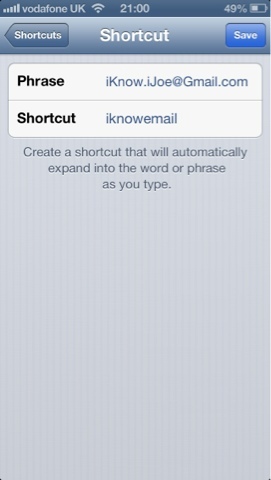 Shortcut - If enabled will place a full stop every time you press space twice. Keyboards - if you are able to communicate in another language then you can add additional keyboards via this menu and they will show up on every keyboard with a little globe symbol. Shortcuts - you can add your own personal auto corrections, so if you find yourself always typing a word incorrectly you can put the incorrect way in as your short cut and the correct way as your phrase. Then every time you type it wrong the device will auto correct it. A great way I use these for is for form filling or information keeping, so I put my email addresses as the phrase and a quick shortcut to them so if I type gmail my email address pops up. iJoe really recommends this as a way to speed up how u use your device. International - You can customise your device to what ever language you require. Accessibility - Apple is The best at making devices everyone can use and in the accessibility options you can really tailor your device to be easier to use if you are hard of hearing, disabled, visually impaired, react better to light, see colours differently. There is a wealth of options for you to use no matter what, there are no barriers here. Two features I will highlight is LED Flash for alerts is a setting a lot of people use, when you have a notification your flash on the back of the phone flashes, much like a blackberry. 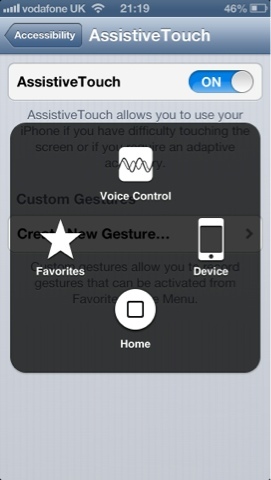 Also assistive touch, if really useful if you have an issue with your hands or your devices home button, when enabled it puts a software home button on the screen that allows you to use your phone as normal. It also shades out when not in use. And finally, the place to go if something not right. RESET. 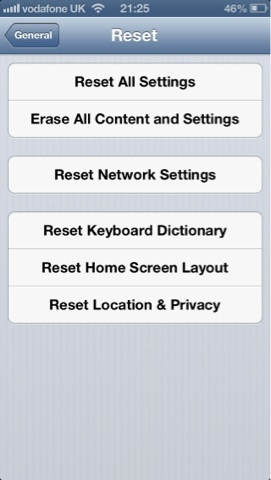 In this menu you can reset your phone in many ways, all will involve some sort of data loss and change to your phone. I would only utilise these options as a last resort and after you have backed up your data to an external source. So that's part two done. A lot of detail about pure settings of your phone to make it work efficiently and to its full capabilities. If you have any questions or queries please email me or visit Facebook page and twitter account. Links at bottom of page. Next time we will be going through Brightness Settings, wallpapers and iCloud.